Press the Play button below to listen to the full interview. 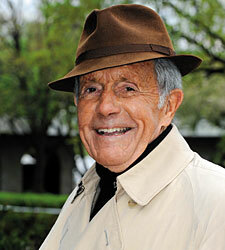 W. Cothran "Cot" Campbell, who revolutionized racehorse ownership and syndication through his Dogwood Stable and who is being honored with the 2011 Eclipse Award of Merit, was the special guest on BloodHorse.com’s “Talkin’ Horses” podcast at 2 p.m. Tuesday, Jan. 17. The podcast was be moderated by Ron Mitchell, online managing editor for BloodHorse.com, and Evan Hammonds, executive editor of The Blood-Horse magazine. Also during the podcast, Jason Shandler, co-host of BloodHorse.com’s “That Handicapping Show” recaps and analyzes the newest Eclipse Award winners that were announced the previous night, including Campbell who was honored for his lifetime of achievement in Thoroughbred racing. Campbell bought his first horses in 1969 and founded Dogwood Stable in 1973. He introduced the concept of syndicated racehorse ownership, bringing hundreds of new owners into the sport. Campbell estimated Dogwood has attracted approximately 1,200 partners during the past 35 years. Since Mrs. Cornwallis became Campbell’s first stakes winner in 1971, she has been followed by such Dogwood notables as Dominion, Domynsky, Nassipour, Southjet, Wallenda, Trippi, Smok’n Frolic, Limehouse, Cotton Blossom, and Aikenite. Dogwood won its first Eclipse Award in 1987 with the steeplechaser Inlander. The stable raced 1990 Preakness Stakes (gr. I) winner Summer Squall, and his daughter Storm Song, who won the 1996 Breeders' Cup Juvenile Fillies (gr. I) and became the stable’s second Eclipse Award winner. According to Dogwood, it has raced 76 stakes winners, including 14 grade I winners and six $1 million earners.